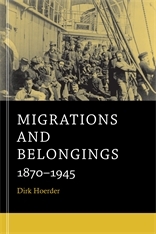 Migrations and Belongings and companion paperbacks by Emily S. Rosenberg, Charles S. Maier, Tony Ballantyne & Antoinette Burton, and Steven C. Topik & Allen Wells present the essays collected in A World Connecting: 1870–1945, the fifth volume of A History of the World. Toward the end of the nineteenth century, new railroads, ports, and steamships enabled people to travel faster and in greater numbers than ever before. 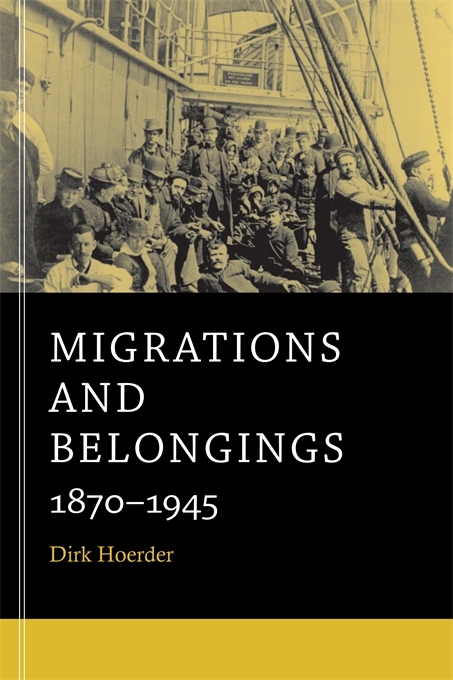 Migrations and Belongings traces burgeoning population movements across several continents from 1870 to the end of World War II. This study explains the complex variables involved in global migrations and the processes of acculturation by which “belonging” takes shape. Dirk Hoerder emphasizes the migration systems that emerge when population clusters move between regions over long periods of time. Eschewing a Eurocentric perspective, he identifies five major systems in different parts of the world where men and women left areas with labor surpluses and swelled regions of urban and industrial growth. These include African slave migration from the 1440s to the 1870s; migration of free and indentured men and women across Asia; Russo–Siberian migration across parts of Asia, North America, and Europe; a North China–Manchurian migration; and an Atlantic system connecting Europe and the Americas. Migrations within and among regions and empires both encouraged population mixing and produced new social stratifications. Questioning the “container” view of states, Hoerder considers instead the dynamic effects of departure, transit, and arrival. Migration, he shows, is both a critique of unsatisfactory conditions in one society and a contribution of human capital to another.